Sophomore PG Jose Alvarado returns healthy to start the year. Coach Pastner and the Jackets kick of year three with a home opener against Lamar this week. Here is what you can expect. The Georgia Tech men's basketball team opens the season on Friday, November 9th at home against Lamar. The Jackets come into the 2018-19 with a lot of question marks that will be answered soon enough. Let's just take it one game at a time. First, let's take a look at Lamar. The Lamar Cardinals are a Southland Conference program. For those of you who are not familiar with that conference, it's the one that Stephen F. Austin blows through each season. They are led by sixth year head coach Tic Price who has coached New Orleans, Memphis and McNeese State as well. He has a career record of 232-189. Last season he led Lamar to a 19-14 record overall, 11-7 in conference play. Similar to Georgia Tech, Lamar has a lot of question marks this season. They lost 5 of their top 7 scorers from and 58% of their offensive production. Nick Garth and Josh Nzeakor both return however. Garth, a 5'11 guard, who averaged 13.6 points, 2.3 rebounds and 1.6 assists per game last season. He shot 37.8% from deep and has made 238 triples in his career. Nzeakor is an undersized front court player, standing 6'6 and 207 pounds, but averaged 12.5 points and 7.5 rebounds per game in 17-18. The Cardinals welcome a quartet of JUCO transfers this season, the best of which seems to be Edwin Jeudy. Jeudy is a 6'7 forward who averaged a double double at Gillette last season logging 13.3 points and 10.5 rebounds per game. Christian Barrett, another undersized JUCO forward, averaged 10.6 and 9.1 at Jacksonville. He is 6'6 and effective on the offensive glass, but I am not sure that will translate at the NCAA level. Vince Holmes is another incoming JUCO who has good size at the guard spot, but isn't much of a shooter. Brandon Battle is a physical specimen at 6'7 playing the three, but doesn't provide much floor stretching ability. All in all, this is a favorable match-up for the Yellow Jackets. This should provide the guys an opportunity to get off to a good start on the season as they should physically and athletically dominate this Lamar team. This is the type of game where you could see Moses Wright be dominant as he often was against lesser opponents last season. What I am really interested to see here is how freshman Michael Devoe plays after sitting out most of the preseason with a toe injury. Other interests include how Jose Alvarado and Curtis Haywood III are recovering from injuries. I would also like to see senior AD Gueye impose his will on offense. I wouldn't mind seeing him be a black hole in this game. That move over the left shoulder was automatic at one point last season and he should go back to that well early and often this year. He needs to establish himself as an offensive threat early this season. As we learned in 2017-18, no victory is guaranteed, but the Jackets should be able to outclass the Cardinals in this contest. Anything other than a convincing victory may raise questions about Coach Josh Pastner's effectiveness, especially after the departure of Coach Tavaras Hardy in the offseason. Photos taken on Saturday, October 13th, 2018 during the Duke vs. Georgia Tech NCAA Football game at Bobby Dodd Stadium in Atlanta, GA.
Continue reading "Duke vs. Georgia Tech Gameday Photos"
ATLANTA, GA – A spirited, neck-and-neck first half between Georgia Tech (3-4, 1-3) and Duke (5-1, 1-1) for the Yellow Jackets’ Homecoming tilt quickly turned into a dispiriting unraveling by the home team. “Three” was the theme. Fumbles on three consecutive touches by Tech’s offense and special teams resulted in three consecutive touchdown drives for Duke in under three minutes of game time, breaking open a once tied game and giving the Blue Devils a comfortable 21 point lead by the end of the third quarter. The rest of the game was simply a formality, with the Blue Devils coasting comfortably to a 28-14 win. Duke’s win marked their fourth in their last five tries against the Yellow Jackets. The aforementioned miscues by the Yellow Jackets were incurred by three different players. None came from the mesh or the pitch; rather the ball was simply lost or stripped while the runner was going down. Nonetheless, the result was the same and doomed Tech’s chances in a game that at one time seemed destined to go down to the wire. 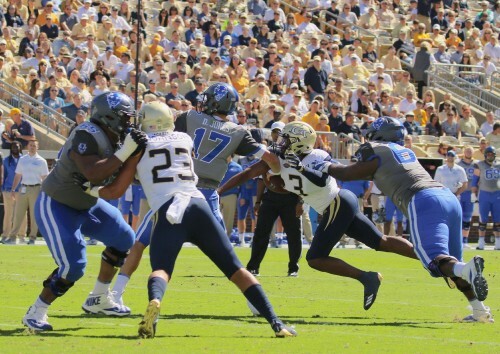 Among the bright spots with the game still in question was the Yellow Jackets’ defense. Prior to the game-changing errors on offense and special times, Tech’s defense was mostly stout. They had allowed just 7 points and 168 yards on eight Blue Devils’ drives. Duke only muscled out 3.9 yards per play. Tech’s defense forced three turnovers in the first half. The first came on 4 downs, with Kyle Cerge-Henderson knifing into the backfield and disrupting a 4th and 1 attempt by the Blue Devils on their second drive of the day. One drive later, redshirt freshman cornerback Tre Swilling timed a corner blitz perfectly, earning the first strip sack of his career and handing the ball back to the Georgia Tech offense. Last but certainly not least, a quarterback pressure by Anree Saint-Amour led to cornerback Lamont Simmons’ first career interception. One cannot understate Saint-Amour’s impact on the game today. The senior defensive lineman continues to get better and had perhaps the best game of his career. His final stat line included two sacks, one quarterback hurry and a forced fumble. Another standout, albeit on one crucial play, was true freshman wide receiver Malachi Carter. With the Jackets staring at a goose egg late in the first half, Carter hauled in a 32-yard touchdown reception from quarterback TaQuon Marshall, pulling the Jackets to a 7-7 tie heading into the halftime locker room. It was Carter’s third career catch. 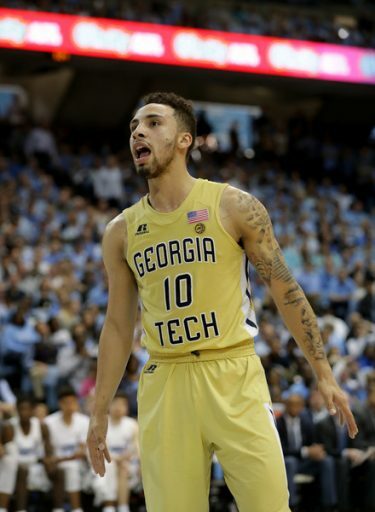 Ultimately the lights went out across the board in all phases for Tech late in that fateful third quarter, and the Jackets never recovered. Up next is a trip to Blacksburg where the Jackets will look to get back on track and improve their chances at a bowl game. The number of wins still needed to reach a bowl? Three. ATLANTA, GA – The much-anticipated debut of new defensive coordinator Nate Woody’s defense was by most measures a success Saturday during Georgia Tech’s home opener against the FCS’ Alcorn State Braves. Most importantly, the defense did its part to help the Yellow Jackets (1-0) blast the Braves (0-1) by a final score of 41-0 at Bobby Dodd Stadium. Two turnovers forced, including an interception by redshirt freshman safety Kaleb Oliver in the <gasp> last minute of the first half. The Georgia Tech defense outscored the Alcorn State Braves’ team, 7-0. Early in the third quarter senior defensive end Anree Saint-Amour forced a fumble, scooped up by linebacker David Curry and returned 15 yards for a touchdown. The Jackets defense limited the Braves to 146 yards and 2.9 yards per play. As a means for comparison, in the Jackets’ 69-6 season opening win vs. the Braves in 2015, the Braves put up 272 yards. Tech limited the Braves to 2 of 11 on 3rd down. Other phases of the game were not as pretty. The offense and special teams executed inconsistently to say the least, despite the offense racking up 543 total yards and averaging 7.5 yards per play. Quarterback TaQuon Marshall struggled to find a rhythm early. Marshall finished the game 9 of 18 passing for 104 yards. Despite the slow start, Marshall finished his last series of the day 5 of 6 passing, capping a 97-yard touchdown drive with a 24-yard pass to wide receiver Brad Stewart in the back corner of the end zone. The Jackets’ ground game did what it’s built to do, racking up 439 rushing and saw three different players eclipse 75 yards rushing individually. One of those was redshirt freshman Jordan Mason, who looked every bit the part of a starting B-Back, the role he filled in his first ever collegiate game. Mason capped his first ever offensive drive with a 28-yard run up the gut, the road to the end zone graded and paved by the offensive line. He finished the day with 11 carries for 85 yards and his first touchdown as a Yellow Jacket. A number of other fresh faces made their debut, including 11 true freshmen. Among those that made their mark were punt returner Juanyeh Thomas (25-yard return in second quarter) and cornerback Jaylon King (forced fumble). While not a new face, linebacker David Curry made his presence known following 21 months on the sidelines primarily due to injury. In addition to his scoop and score, he was visible elsewhere on the field, tying for a team high four tackles. Place kicking remains a concern. Today’s performance included a missed extra point and missed field goal, the latter from 51 yards out. Nonetheless, early evidence provided little reason to believe that special teams are any less “special” this year when compared to last. Continued improvement will be welcome and potentially necessary with a visit to the South Florida Bulls on deck. Bulls head coach Charlie Strong will have his squad ready for its first of two power five opponents. 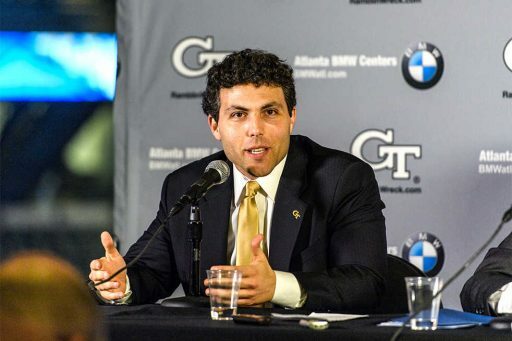 ATLANTA, GA - Since his hiring in 2016, Georgia Tech Head Coach Josh Pastner has told everyone who is willing to listen, "this is a five year rebuild." He has also maintained that the 2019 recruiting class will ultimately decide whether or not that rebuild will be successful. Pastner has a sterling reputation as a great recruiter. He recruited the best ever class by ranking as the head coach of the Memphis Tigers. More recently, he has diligently worked at making those words into a sort of prophecy as September 2018 fills with official visits from high profile players in the 2019 class. Boogie Ellis: A five star point guard out of Mission Bay in San Diego has scheduled his official visit to Atlanta from 9/14-9/16. Ellis is a five star recruit also being courted by Arizona, Oregon, San Diego State and Gonzaga. Robbie Beran: One is the biggest risers of the 2018 summer session, Beran is a big wing with the much coveted “Nowitzki game”. Also of note to Georgia Tech fans, he is a 4.0 student with a 1220 SAT. The word is he will be visiting Atlanta officially this weekend. Marcus Watson: Watson is the local prospect that all Yellow Jackets fans want and the program needs. He will be on his GT official on 9/21. He is visiting Boston College this weekend. Orlando Robinson: A 7 footer out of Las Vegas, Robinson is an interesting player. Louisville is the school to be scared of here, but you have to wonder if he is a secondary option for Chris Mack. Orlando visits Atlanta at the end of September. Ismael Massoud: Another big wing with tremendous shooting ability, Massoud is the prototypical Pastner recruit. He will be joining Robinson in Atlanta on 9/28. Also of note, Coach Reveno is the lead on Massoud and he could really use a recruiting win. Any four-way combination out of that group should be considered a huge recruiting coup for Pastner, and it would generate national publicity for Tech and the class. While Watson may be the most coveted recruit among Yellow Jacket fans given the desperation to "put a fence up around Georgia", Ellis would be by far the most impactful early on. The younger brother of former GT point guard Justin Moore, Ellis saw his stock explode this summer rising up to the #25 recruit in the country. He is a three level scorer with excellent handles and big time swagger. The fan base of this program is simply waiting for something to go positively so they can be heard. After an overachieving first season under Pastner in which everything went right, it felt as if 2017-18 was the season where nothing could break our way. In other words, it was a harsh and immediate regression to the mean. Once again, there is reason to be optimistic in the ATL as this coaching staff has put the program in place to land possibly the best recruiting class, talent-wise, since 2009. Let's hope that is where the comparison ends between those two classes in Georgia Tech history.